Our blacksmith training program is a two year commitment working one day per week. We begin training on Saturdays for about 3 months on basic blacksmithing. After the initial start-up the new smith changes their training day to join their new team to complete Level One training. 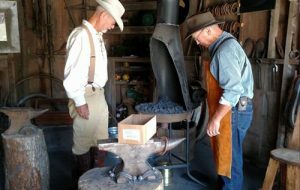 Level One is identified by the California Blacksmith Association (CBA) as the Western States Certificate Curriculum. 1) Interpreting the Gold Rush history from the blacksmiths perspective to the visiting public. Springtime in the park is so busy there is little time for anything else. 2). Making items period correct items for the park and for sale in the Mercantile. The 25 items we make for the store must be learned before they can be produced. 3). Making items for themselves and their families. This is a good time for the new smith to use their new skills to make the tools of their new trade. Punches, drifts, tongs, hammers etc. Its rare to had someone interested in blacksmith anymore and classic workshop too. Great, I want to visit this blacksmith to see how blacksmith doing their job. Longing adventure game using blacksmith to create all thing. Keep up the good job guys!